Fort Key Calamity is the fourth level of World 4 found in Yoshi's New Island. Yoshi starts the level in a fort with three doors in front of him. The door on the right leads to a dark room with some flame-like enemies lighting the way and a key at the end of the room. The one on the left leads to an area with spikes and spiky platforms. The spiky platforms are in two colors and there are colored switches controlling the ledges. Each switch controls the ledges that match the color of the switch, rotating the ledges so that the spikes are facing up and vice versa. There is also a key at the end of the room. The locked door in the center leads to a Checkpoint Ring and a second locked door. The second locked door leads to another Checkpoint Ring and a Mega Eggdozer which opens up the way to the boss door where Kamek awaits. This time, Yoshi will be fighting Kamek on spiky platforms with switches that rotate the platforms. 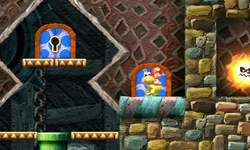 To hit Kamek, Yoshi must throw an egg on one of the rotating switches. If done correctly, the platform that Kamek was standing on rotates so that the spikes are facing up, hurting Kamek. Repeat this process two more times to defeat Kamek.